Corum’s BaselWorld 2013 exhibition introduced two new watches to the brand’s Bridges Collection and an all new Admiral’s Cup watch, each available in several variations and materials. The TI-Bridge Automatic Dual Winder is the first in the collection to use an automatic caliber CO 207, developed by Corum’s watchmakers. The Dual Winder system uses two inline-mounted oscillating weights connected by a transmission arbor that makes them move in parallel, in either direction. The movement is centered with four titanium crossbars on an anthracite grey dial. The tonneau case measures 55mm, is slimmer than previous iterations and is water resistant to 30 meters. The TI-Bridge Automatic Dual Winder is available in grade 5 titanium or red gold, and mounted on a rubber-type leather strap or grade 5 titanium bracelet. 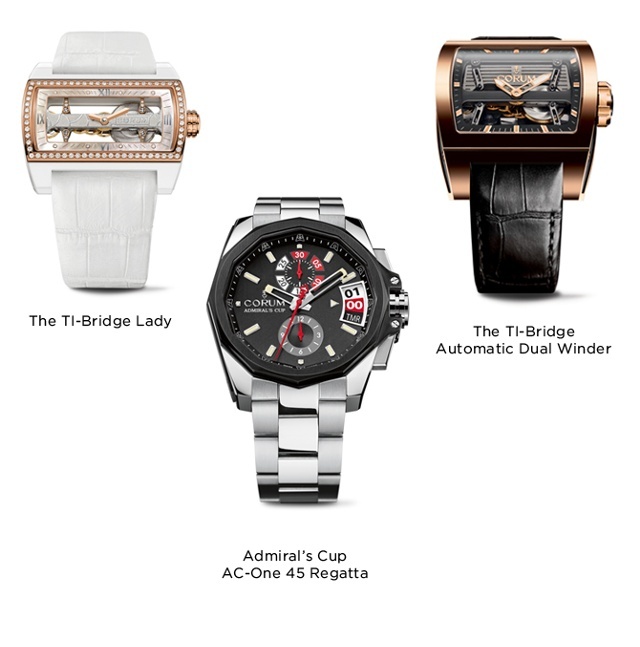 The TI-Bridge Lady is the first feminine model in the Bridge series. 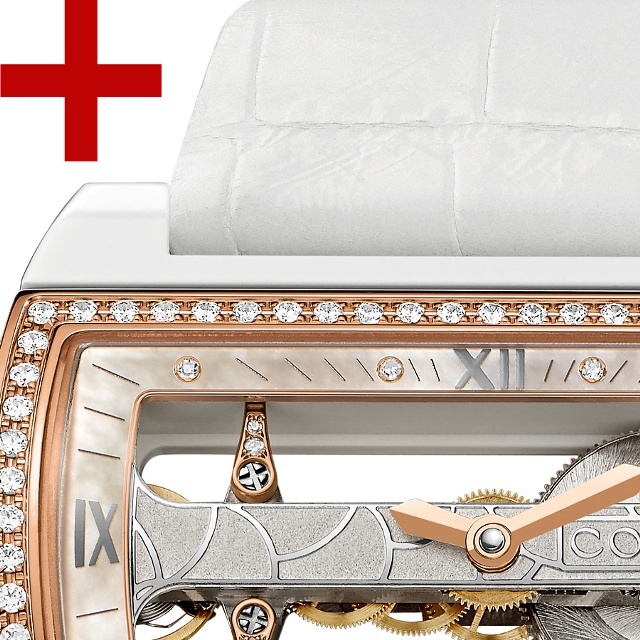 Inside the watch is a Corum CO 007 hand wound movement, ornamented with white diamonds and undulating curves. Akin to the other Corum Bridge watches, the TI-Bridge Lady uses a dial-free architecture, allowing the movement to be seen from the front of the watch and through the sapphire crystal caseback. Three variations of the watch are available with a white ceramic case and crocodile strap, and a fourth white gold version is also available. Corum’s Admiral’s Cup AC-One 45 Regatta has all of the classic attributes of the Admiral’s Cup collection created in 1960, including the 45mm case, 12-sided bezel and nautical pennants on the inner bezel ring. This addition uses a new automatic caliber, the CO 040, which powers a jumping regatta countdown function with numerical aperture display, and a chronograph function. The countdown is programmed with the crown and triggered with a pushbutton. When the countdown expires, the chronograph begins running and is capable of timing up to 12 hours of racing. This nautical watch is water resistant to 300 meters and can be had on a titanium grade 5 bracelet or crocodile leather strap with folding clasp.